The facial nerve is one of 12 cranial nerves. It contains motor nerve fibers responsible for facial expression as well as other nerve fibers involved in sensation, taste, and secretory function. The motor pathway begins within the premotor and motor cortex. Upper motor neurons then connect the premotor and motor cortex to the facial nucleus located within the pons. Lower motor neurons exit from the facial nucleus and continue on to innervate the various mimetic muscles of facial expression. It is important to note that the forehead receives bilateral innervation from the facial nucleus, whereas the remaining facial musculature receives only ipsilateral innervation from the facial nucleus. 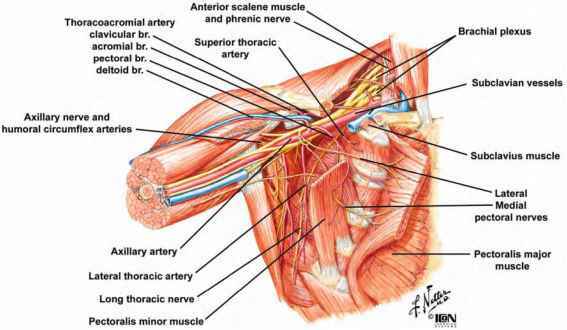 Along with the muscles of facial expression, the facial nerve innervates the auricular, posterior digastric, stylohyoid, platysma, buccinator, and stapedial muscles. The facial nerve also contains parasympathetic nerve fibers in charge of the secretory function of the lacrimal gland, submandibular gland, and sublingual gland. This parasympathetic innervation is derived from the superior salivatory nucleus within the pons. These parasympathetic fibers synapse within the sphenopalatine ganglion, stimulating lacrimal gland secretion, and within the submandibular ganglion, stimulating submandibular gland and sublingual gland secretion. In addition to the motor and autonomic functions of the facial nerve listed above, the facial nerve contains sensory nerve fibers subserving taste from the anterior two-thirds of the tongue via the chordae tympani nerve. These fibers synapse within the geniculate ganglion and continue on to the solitary nucleus within the pons. The facial nerve also innervates cutaneous sensation to the postauricular area, conchae, and a small portion of the superior tympanic membrane. These fibers synapse within the geniculate ganglion and continue on to the spinal nucleus of the trigeminal nerve within the pons. The course of the facial nerve can be divided into intracranial, intratemporal, and extratemporal segments. The intracranial segment, known as the pontine or cisternal segment, spans roughly 25 mm and connects the facial nerve from its origin in the brainstem to the entrance of the internal auditory canal (IAC), where the intratemporal course of the nerve then begins. The intratemporal portion can be divided into four segments: meatal, labyrinthine, horizontal, and vertical. The meatal segment courses from the beginning of the medial portion of the IAC, termed the porus acousticus, to the lateral end of the IAC, termed the fundus. The facial nerve lies within the anterosuperior quadrant of the IAC, demarcated by the falciform crest horizontally and Bill's bar vertically. The facial nerve is still ensheathed by an extension of the meninges at this point. The next segment, termed the labyrinthine or petrous segment, is only 5 mm in length and runs from the fundus of the IAC to the geniculate ganglion. It is here that the bony channel through which the nerve runs, the fallopian canal, is at its narrowest dimension of 0.7 mm, leaving the nerve particularly vulnerable to traumatic or compressive forces. The labyrinthine segment contains the geniculate ganglion housing cell bodies for sensation as well as taste. The greater superficial petrosal nerve branches off from the facial nerve here and continues on to supply parasympathetic innervation to the lacrimal gland. At this point, the facial nerve turns abruptly and runs in an anterior-to-posterior plane. This point or turn is termed the first genu of the facial nerve. The next segment, the tympanic or horizontal segment, spans 10 mm in length and continues from the geniculate ganglion to the second genu of the facial nerve. This is the most common site of facial nerve dehiscence, found in half of the population. Once again, the facial nerve has a change in course and at the second genu turns to run in a superior-to-inferior direction. The ensuing mastoid or vertical segment is 15 mm in length and runs from the second genu to the stylomastoid foramen. Branches to the stapedius muscle and the chordae tympani nerve exit from this segment of the facial nerve. This ends the intratemporal course of the facial nerve. Once the nerve has left the stylomastoid foramen, it becomes extratemporal and quickly branches at the pes anserinus into the temporozygomatic and cervicofacial divisions. Most often, the facial nerve divides further into five branches: temporal, zygomatic, buccal, marginal mandibular, and cervical. However, numerous branching patterns have been described and the extratemporal nerve course is known to be highly variable. The arterial supply to the facial nerve is from both the carotid and the vertebrobasilar systems. The meatal segment is supplied by labyrinthine branches of the anterior inferior cerebellar artery (AICA). The labyrinthine segment is supplied by the petrosal artery, a branch of middle meningeal artery coming from the internal maxillary artery. The stylomastoid artery supplies the mastoid and tympanic segments (Fig. 1).